Why not switch to the BNZ Global Plus Cards? 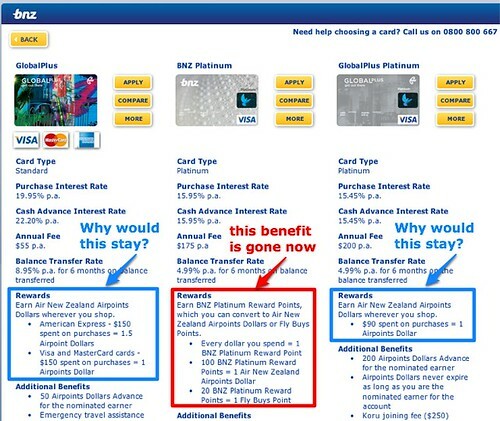 Posted byLance Wiggs	 October 29, 2009 3 Comments on Why not switch to the BNZ Global Plus Cards? ccselector.html, originally uploaded by LanceWiggs. Technebish and Adam suggest I switch to that I switch to the Global Plus Platinum Card. Here, straight from the BNZ website, is the comparison table between the Global Plus, Platinum (mine) and GlobalPlus Platinum cards. They all show Air New Zealand AirPoint Conversion. Why would the other two stay if the one in the middle is going? I doubt they will ditch airpoints on the GlobalPlus cards – they have AirNZ branding on them and include your airpoints number. I was (pleasantly) surprised to see that I am now earning status points as well as air points dollars on my GP card. Maybe this has something to do with them removing the conversion option? As it turns out you are quite correct – Air NZ and BNZ will continue to support the global plus card range. I’ve asked BNZ via internet mail (and here, now) to swap my Platinum card for the Global Plus Platinum card. I think it would be a great idea to offer that deal to all people in a similar situation. Kiwibank have just launched their own version of the Global Plus card, including Gold and Platinum options.